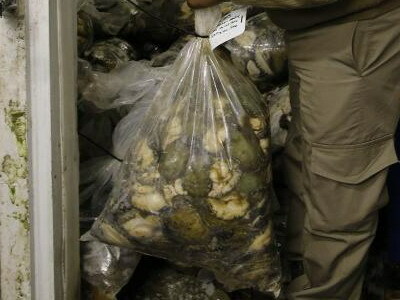 The fight against poaching of maritime resources, including abalone, focussed on Western Cape’s Overberg region last month with the arrest of 20 suspects and confiscation of abalone and rock lobster valued at R174 million. The 16 day-long tasking saw the SA Police Service (SAPS), Department of Agriculture, Forestry and Fisheries (DAFF) and Western Cape provincial conservation agency, Cape Nature, make what the national Department of Environmental Affairs called “a notable success”. Spokesman Zolile Nqayi said in a statement: “Operation Phakisa continues its fight against poaching of marine resources with the redeployment of its team to the Overberg region”. In addition to abalone and lobster confiscated the tasking saw diving and other equipment used by poachers worth more than R194 000 seized. Nqayi said in the first six months of the 2018/19 financial year a number of operations were conducted as part of Operation Phakisa’s initiative five: enhanced and co-ordinated compliance. These resulted in confiscations to the value of R19 801 249. This is over R18 million more than was taken from poachers and suspected poachers by various government departments and agencies in the first six months of the previous financial year. The major improvement in results is ascribed to, among others, “multiple institutions, supported by NATJOINTS, taking part in pro- and reactive operations in the maritime environment”. “Searches, visits and operational activity increased significantly, projecting a visible government presence in coastal regions,” Nqayi said.